A new teaser trailer for “Aladdin” has finally revealed Will Smith as the blue Genie in Disney’s upcoming live-action remake of the 1992 movie. 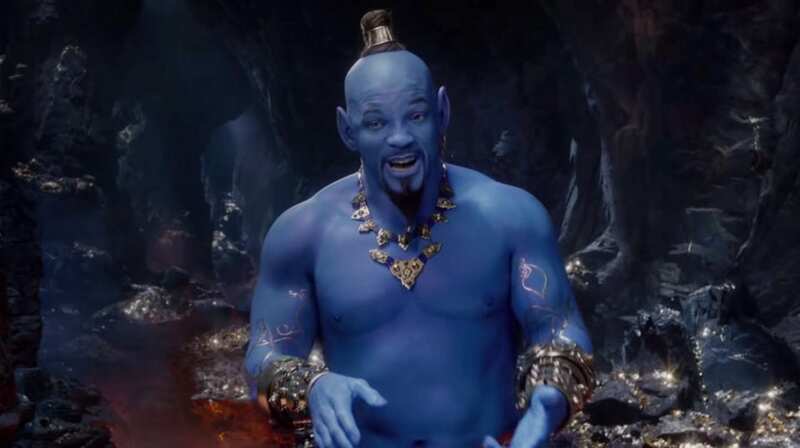 The former “Fresh Prince” and “Men in Black” star looks worlds different as the genie in a lamp previously voiced by Robin Williams. SlashFilm suggests Disney can still “fix it” before the movie hits theaters, but the motion-capture CGI so far doesn’t look as good as the promo photos released so far. “Aladdin,” directed by Guy Ritchie and also starring Mena Massoud as Aladdin and Naomi Scott as Princess Jasmine, opens May 24. Halsey pulled double-duty as host and musical guest for “Saturday Night Live” this weekend, impressing viewers with her multi-tasking skills especially when she sang “Eastside” while painting a portrait. Other “SNL” highlights included a “Meet the Press” spoof on the Jeff Bezos-National Enquirer scandal, “Weekend Update” tackling the blackface controversies in Virginia, a Valentine’s Day song, a new “Empire”-themed “Them Trumps” skit, and tributes to Black History Month and Women in Congress.